So you need a Logo: What to Expect + Getting Started — MKW Creative Co. Your logo is your brand's biggest identifier. Let's make sure it's a memorable one! Here's what you'll need to know to get started and more notes on the design process. INITIAL CONSULTATION Let’s meet for coffee or over the phone so I can get a sense for what your logo design needs are. Often times, just a logo is just really scratching the surface. 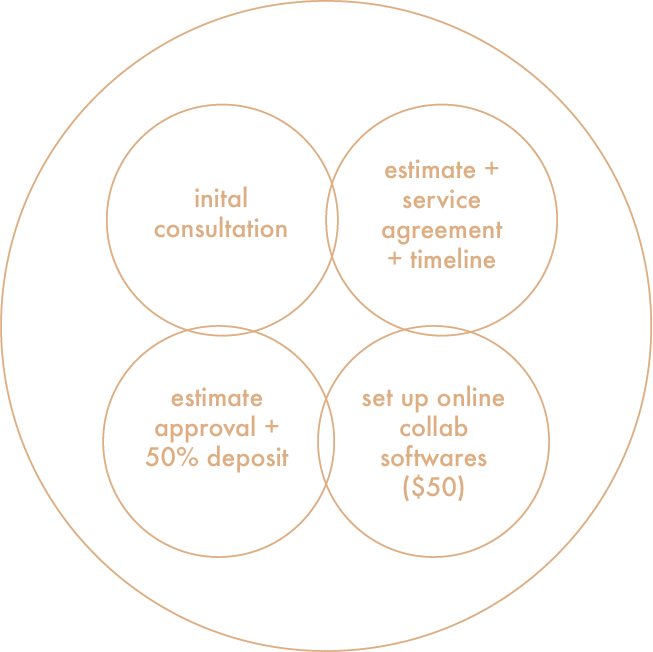 ESTIMATE + SERVICE AGREEMENT + TIMELINE After our meeting, I will be sending you a comprehensive estimate along with my service agreement and a timeline for deliverables. ESTIMATE APPROVAL + INVOICE FOR FIRST 50% I ask for a deposit of 50% upfront to get started on design work. Remaining 50% will by due upon the delivery of the final files. SET-UP COLLAB SOFTWARES I charge a one-time new client set-up fee of $50 for unlimited storage on Dropbox, Google Drive and Basecamp. MARKET RESEARCH, IDENTIFYING COMPETITORS When designing a logo, it is imperative that we do our research. Who are your competitors? What do their visuals look like and how do they present their brand? What do and don’t you like about their presentation? What other brands do you admire outside of your industry? GATHER DESIGN INSPO This is homework for both you and me. What can we use as design inspo? What do you want your logo and brand to feel like? How do you want your customers to feel? Like baking a cake, the more ingredients you can give me, the better your cake is going to turn out, so keep the inspo coming! Pinterest, Instagram, Dribbble and Behance are my favorites. The design process is iterative! Each iteration is called a Draft. You will see them labeled as such in Basecamp. Draft 1 is going to be a big , somewhat scattered collection of all of the ideas we discussed. The second draft will be the refined logos from Draft 1. Next draft will explore color options and the 4th draft will be the refined versions of Draft 3! And voila! You’ve got a logo! EXPORT ALL FILES You will be getting .png, .eps, .pdf and .ai files of your logo mark, submark and icon if applicable. I will also add in the .txt for the fonts and the color codes to the Dropbox folder. UPLOAD TO SHARED DROPBOX All files will be delivered via Dropbox or Google Drive. You will receive all the file formats as well as the original .ai files. PAY REMAINING 50% INVOICE Once the final files are on Dropbox, your final invoice is due! You can pay online with CC or send me a check.